“We think the evidence is pretty clear and it keeps mounting,” so stated an attorney about Oklahoma’s earthquakes. The chief of the Pawnee Nation made it clear over the weekend that his tribe intends to do something about the growing earthquakes around Pawnee and northern Oklahoma. And if that means joining those who have sued oil and gas companies and their wastewater injection wells, so be it. “The thing that upsets me the most is that this is not going to stop,” declared Andrew Knife Chief, executive director of the tribe during a weekend informational meeting held at the Roam Chief Event Center. Officials of the Sierra Club, the City of Pawnee, experts from Oklahoma State University and attorneys gathered for the event. 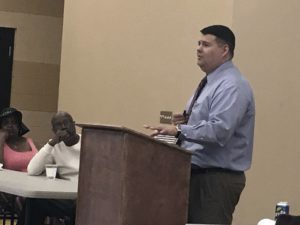 He pointed out that while the city of Pawnee cannot pass any kind of city resolution banning underground injection control wells, the tribe can.